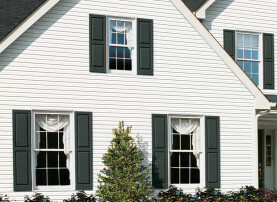 Both beautiful and affordable, Nantucket vinyl siding is warranted to perform for a liftetime. * Engineered for durability, it resists scratching and denting. And because color is manufactured right into the panels, they won’t blister like painted surfaces–keeping maintenance to a minimum. Available in a broad selection of colors and profiles, Nantucket vinyl siding offers a distinctive look that’s virtually maintenance-free. Select siding in one of these three popular profiles. Then, mix and match siding and trim colors for a variety of architectural effects.